The recent leak of thousands of sensitive U.S. diplomatic cables will have no adverse effect on America's international relations, U.S. Secretary of State Hillary Rodham Clinton declared Wednesday at a security summit. Clinton said she has discussed the revelations published on the WikiLeaks website with her colleagues at a security summit in Astana, the capital of Kazakhstan. The event is the first major international meeting of leaders and top diplomats since the memos began appearing on the website and in numerous international publications earlier this week. The secret U.S. Embassy memos published by WikiLeaks contain frank details on several leaders attending the Organization for Security and Cooperation in Europe meeting in Astana. "I have certainly raised the issue of the leaks in order to assure our colleagues that it will not in any way interfere with American diplomacy or our commitment to continuing important work that is ongoing," Clinton said. "I have not any had any concerns expressed about whether any nation will not continue to work with and discuss matters of importance to us both going forward," she added. The Obama administration has harshly criticized the leaking of the cables, saying the details in them could put lives at risk. 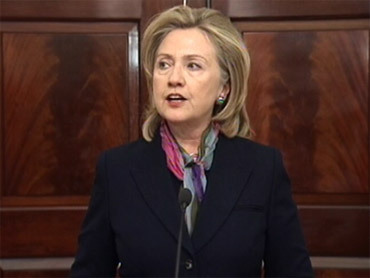 "I anticipate that there will be a lot of questions that people have every right and reason to ask, and we stand ready to discuss them at any time with our counterparts around the world," Clinton added. Several officials at the summit echoed her comments. British Deputy Prime Minister Nick Clegg, who met Wednesday with Clinton, released a statement saying the "recent Wikileaks disclosures would not affect our uniquely strong relationship." Kazakh Foreign Minister Kanat Saudabayev, commenting on leaked U.S. cables about top officials in his own government, also said "this will have no bearing on our strategic relationship." In an interview with Time magazine, WikiLeaks founder Julian Assange said Clinton "should resign" if it's shown she ordered U.S. diplomats to gather information on other foreign officials, including those from the United Nations.